Android has achieved a record market share of 87.5 in the smartphone shipments in the 3rd quarter of 2016 according to a report from Strategy Analytics. That means now Android smartphones sales command nearly 90 percent market share, 9 out of 10 smartphones sold now are Android smartphones. The growth of the Android ecosystem is propelled by the low cost devices launched in developing markets like India and others. Global smartphone shipments 6 percent from 345.2 million in Q3 2015 to 375.4 million in Q3 2016. Android market share increased from 84.1% to 87.1%, and iOS market share saw decline from 13.6% last year to 12.1% this year. 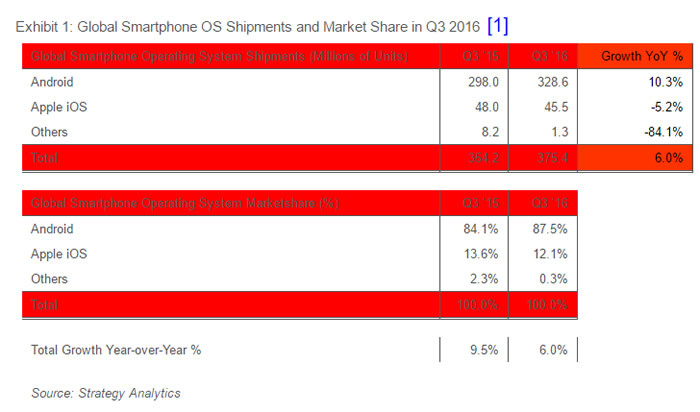 Other operating systems like Windows Phone, BlackBerry and Tizen etc., their market share gone from 2.3% to just 0.3%. Windows Phone is included in the others category because the total number of shipments they shipped is not big enough to warrant a separate category. It is a sorry state of affairs at Windows Phone, the platform once has some hope to compete in the smartphone OS segment has now been completely sidelined.